I’m looking at the weather and it seems that no real change is in prospect before the end of the month, which is pretty much unprecedented. Maybe a change to more cloudy weather from Wednesday this week. I’ve spoken to the French Avalanche Research Institute (http://www.anena.org) who have confirmed just 8 avalanche deaths compared to 13 last year. Currently a record low and down to a very stable snowpack. I’m worried that the last two years will have lulled us into a false sense of security for when we do get a bad winter. On the Grands Moulins in the north Belledonne on Monday, I ran into a different snow problem—not enough of it to cover the bushes at low altitude. Otherwise it was a good day - see photos. Sharon had a shoulder injury so she couldn’t risk any impact on it from skiing, so she used snowshoes on the forest road approach to get some outdoor exercise in a controlled way. * S-facing summit slope was well-consolidated, though perhaps a bit irregular. Coverage was a bit lean. Looked like the only continuous line of snow for descent was along the east edge—which is what I took. (Actually there was enough exposed grass and rocks on the ridge that I decided to just boot it all the way from the top of the cirque to the summit). * I didn’t see any way to connect by skiing between the south summit slope and the cirque, so I skied down below the col, then booted up its west side. * In the upper cirque I find some descent heavy-powder-like stuff on NE aspect. * A bit crusty on the gentle areas on the cirque. * Some decent mushy snow on SE-facing slopes lower down thru sparse trees. * Then the nasty part of getting thru the uncovered bushes. * Forest road was almost all well-covered except a little in the last section down to parking. I was so glad to reach the forest road and get back down to Sharon at the car. It is a long traverse, hope Sharon didn’t wait too long! Yes I also found some powder-like stuff on somewhat-sheltered NE slopes yesterday, and it was fun skiing in the limited area where I found it. But higher up out of the valley on the exposed summit slopes of the Pointe de la Terrasse (east Beaufortain, Cabou Savoie guidebook #44) the SW-facing snow was eroded by wind and sun above 2400m—lots chattery little bumps and some breakable crust. The S-facing steeper narrow section around 2300m which connects the Charbonnet valley to the summit slopes was a mess of debris, though still turned out to be sorta skiable. The nice skiing was on the NE-facing side of the valley around 1900-2200m. Lower than that was mixed with more crust. Then below the Planey buildings around 1600m the NE-facing slopes were mushy and supportive, pretty skiable (with lots of previous tracks). I was able to ski (with careful + lucky route selection) all the way down to the parking at 1300m. Starting out in the morning, the trees and limited snow at the bottom looked nasty, and I didn’t want to repeat the low section on the Grands Moulins—so first I tried climbing on the road high along the side of the valley, but then I couldn’t see how to traverse into valley. So I skied back down and tried it from near the bottom (as the guidebook said). After 100m of tricky navigation thru trees w limited snow, it opened up into straightforward climbing to do the tour. (Next time I might go a little ways up the second left-aiming switchback before turning NE into the valley). There was quite a bit of rain overnight up here in the Haute-Savoie but the temperatures were also pretty mild. The zero isotherm was around 1800 meters overnight which normally means wet snow down to 1500 meters or there abouts. There has certainly been a bit of snow at this altitude (the Jura is still shrouded in cloud though). Didn’t see any sign of new snow in the northern Beaufortain today. What I did find was really bad skiing on a South face around 2000-2500m. I was on the Aiguille Croche, near Col du Joly, sorta between Hauteluce + Contamines + Megeve (Cabou Savoie guidebook #38). The snow had pretty big “sun cups” and/or “wind fins”, I think I’d call it. We need some new snow. The weather was Scorchio over the weekend with more records being broken and temperatures in the 20s in some parts of France. Saturday I was at the Jurrasic resort of Lelex which still seems to have good snow down to resort level. The snow was surprisingly good although we were a bit late skiing down - after 2pm - which is not ideal on some of the steep grassy slopes we covered. We had snow from les Contamines at 1100 meters but the first part of the trail was ice covered needing crampons. There was around 80cm of snow depth on the ground at 2000m… a good cover but we need a big top up. Lower down things are more catastrophic when you leave the forest trails on north facing slopes. On south facing slopes there is little cover below 1800m. Talking of which the weather looks set to change from Tuesday but with temperatures staying very mild. The zero isotherm seems to be stuck around 2000 meters which means snow down to 1800m at best. There are going to be strong winds from the West over the next few days which will mean a lot of loading on east sector slopes and an increase in the avalanche risk. Something we’ve not been used to recently. In short, a poor end to another very warm month. Winter has been cancelled this year. I also found the skiing mostly good. I’d say that was the result of skiing down later rather than earlier. The slopes up higher (2400-3100m) generally westerly, had a fairly friendly mushiness that made me feel comfortable on those steeper slopes - (though I suppose an hour earlier would have been better). The gentler slopes around 2000-2300m was where I thought it was too mushy for good skiing. And the only place I saw snow glide a little on the grass base was on a small East-facing slope, which had been getting sun all day. Then we got into Northerly shaded slopes, and in the absence of sun they quickly hardened to firm enough to support a ski edge, so we had straightforward hardpack skiing. (until the last 200m of ice, which I was glad to take on crampons). Tibaut had a good idea for the tour—I wasn’t expecting a good day like that after the last two weeks weather. There was about 10cm of snow overnight from 1800-2000 meters. At les Saises (1700 meters) 20cm of snow depth has been lost in a week. I did a quick comparison with last season. The winter has been better below 2000 meters but snow is slightly poorer on altitude with less precipitation. Still the avalanche risks are still there. An avalanche measuring 300x50 meters and 2 meters at its deepest point crossed an open ski piste at Merdassier (La Clusaz - Haute-Savoie). No one was on the run at the time. The avalanche occured at 15h50. The press are claiming that a ski tourer triggered the slide although this theory has been described as premature by the mayor of Manigod. It is more likely to be a natural slide caused by the snowpack becoming overloaded with water and the warm afternoon temperatures. The slide occured at 3pm on a slope of around 20-25°. It appears the slide was triggered by the group. No-one was caught. The slide was on a south facing slope with a poor refreeze and spring like temperatures. The reporter said the slab was resting on a weak layer of depth hoar. The group were not leaving a safe distance when descending and had noticed setting in the snowpack when climbing over the spot (whoumphs). A reminder to descend early in these February spring conditions. In the Vanoise on Wednesday, I found only about 5cm of new snow at 2800m and 1cm at 2300m. On the Meteo France site they said that the Massif Central had a dry and warm January. I’m looking at the Jura out of the window and it is not any better :-(. There has been some 5-10cm of snow above 2100-2200 meters overnight but the zero isotherm has been around 2400 meters (and up to 3200 meters during the day)! Not bad for February - that’s more like mid April. As we’ve mentioned above there is an avalanche danger particularly in mid-altitudes due to the snowpack getting overloaded. The Ecrins avalanche and the slide at la Clusaz are both signals not to be out too late. 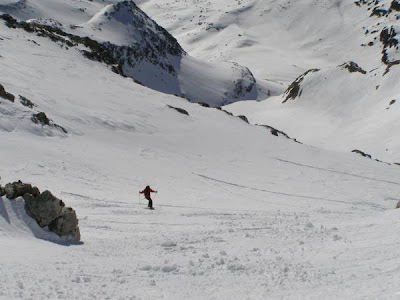 Generally the situation is poor for an end of February especially on southern slopes and below 2000 meters where the snow-pack is very wet, sometimes through the whole depth with some big avalanches being observed. The current conditions are not doing much to improve the situation. We are hoping for a bit of snow lower down from the first week of March - last year we had snow to valley level for a couple of days with some excellent powder skiing at the end of March but the long term forecast doesn’t look so good. In any case, focus on north facing slopes and go high. * summit pyramid West ridge (normal climbing route) was pretty much bare of snow. Northwest face (sometimes skied) looked pretty wind-blasted. * glacier sections seemed well-covered. I could see one or two crevasses across my route whose outlines were visible but bridged with snow. * most southwest facing slopes around 2000-2500m lacked continuous snow, but had some remaining snow. * once I made it thru the mush and reached the Chanel access road around 1600m, I was able to ski on the (walker-snowshoer-packed) snow (with some gaps) down to within 70m of the Bourg St Maurice - Val d’Isere road. (I doubt this will be possible this weekend). But in shaded slopes low by the Nantcruet creek, SW slopes still hold snow for continuous skiing down the valley to the access trail from Nantcruet village. Snout of the glacier, which I evaded by going around to climber’s right. Now up on lower part of glacier, feels pretty comfortable. Looking up the West ridge to the summit, not what I expected. I started climbing it, but turned back with all the loose rock and lack of motivation to ski the wind-blasted NW face. My descent and climbing tracks, with Grande Sassiere summit pyramid above—Lack of deep fresh powder at 3400m altitude. But nice to be able to do a big springtime peak in February.